Baldwin & Phillips Construction is proud to hold the National Association of Home Builders, Certified Green Professional™ (CGP) designation. The CGP designation recognizes builders, remodelers and other industry professionals who incorporate green building principles into homes without driving up the cost of construction. With Baldwin & Phillips Construction, your custom built mountain home will provide you with the relaxed mountain lifestyle you and your family deserves. But don’t take our word for it, listen to what our customers had to say. We provide superior construction craftsmanship, unsurpassed in quality and built with beauty and strength in mind. 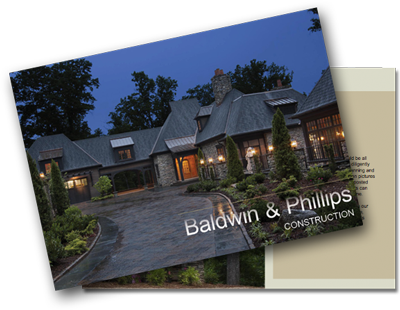 Learn why your next mountain home should be built by the Baldwin & Phillips Construction team of experts. View our full-color brochure on the web! Find out more about our quality construction and craftsmanship by viewing our online brochure.